Well, maybe this thing isn’t quite over yet huh? 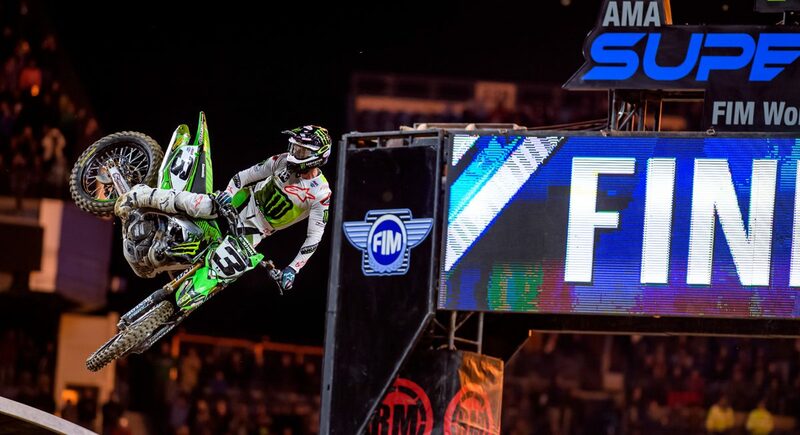 Monster Energy Kawasaki’s Eli Tomac won his second race in a row, fifth of the year in Denver, Colorado with a dominating performance that looked like a few other rides we’ve seen him have in the past. Tomac’s clearly feeling it’s been a bit of an up-and-down season for him but it’s been nothing by ‘ups’ the last couple of weeks. But is it too little, too late for ET3? Down 21 points going into this weekend, he’s got it down to 18 but just two races left. 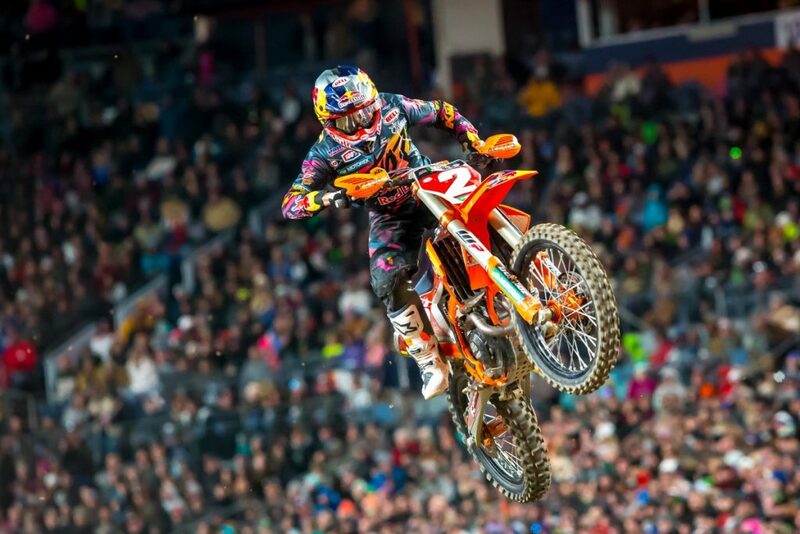 Red Bull KTM’s Cooper Webb showed his mettle yet again with a late race pass on his teammate Marvin Musquin to take second place and keep the loss of points to just three. 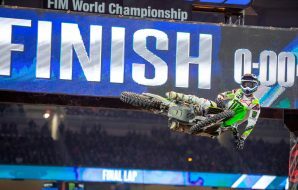 Not much Webb has to do but stay in third or fourth and even if Tomac wins the last two – which he certainly could do – he’ll have the 450SX title and Tomac will have yet again the most wins in the series with seven but without the thing he wants the most which is the title. The hometown crowd certainly loved Tomac’s flash out there but they, like many of us, have to be wondering: why now and where was this level of performance sooner? 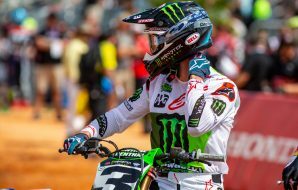 It’s been a trying season for Tomac, he hasn’t been the same guy the last two years and a lot of it, if the whispers are to be believed, are due to the adaptation to the new 2019 Kawasaki KX450 including the hydraulic clutch that’s been the source of that steam you see coming out of ET3’s bike most weekends. The acclimatization to the bike hasn’t been as easy as anyone would’ve liked despite the production bike being the best Kawasaki 450 in years according to many of the magazines. Now, of course Tomac’s bike is way different than the production bike but the model is a step up for the green guys. The crew chief for Tomac, Mike Williamson, left the team about a month ago and although everyone played nice with the departure, I can confirm there was some tension there between the Tomac camp and Williamson in regards to the bike’s development. I spoke to Eli’s dad John Tomac before the Detroit Triple Crown and he indicated to me that Eli’s window of comfort on the motorcycle wasn’t there yet and when it’s not, he’s not going to push it through. If the comfort isn’t there, I get it. This is a dangerous sport when you’re not simpatico with the motorcycle. I don’t think it’s as simple as what you’re gonna hear this week that now that there’s no pressure, he’s almost a race down going into last week Tomac’s going to ride great. This is a rider that’s got two 450MX championships and 250SX and MX titles, he knows pressure and what it does. 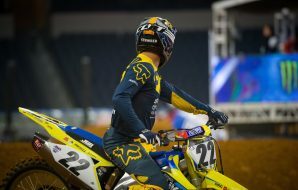 No, I just think that last week he got a bit of a break with big whoops that hampered his competition (Marvin Musquin and Webb) and also a crash from Honda’s Ken Roczen who was the fastest rider all day. Tomac turned his so-so start into a win. This week he gated decently and then on some slippery dirt, in front of his home crowd, he was feeling it. Track conditions and some fortunate circumstances helped him win two in a row. I don’t think the title pressure is a reason why we’re seeing this now. Webb showed some great speed and fortitude in getting second. To me, he’s impressed with his rides when he doesn’t bring his ‘A game’ but when it counts he picks it up. Webb’s not feeling any real heat here and managing this thing nicely along the way. We’ve got two more to go and if Tomac can keep this up and Webb has any issues in New York, we’ll have a very tense and exciting Las Vegas finale but for now, let’s keep enjoying Eli’s harrying and wonder which ET3 will show up from one weekend to the next. Keeps it exciting!